Below are screenshots taken on August 27, 2016 of his Facebook page and Google Plus account. Notice that he identifies his account as a “Government Organization.” On his Google Plus page he identifies his employment as “Federal Agent Agency” and “Delivery Manager” and that he lives in Washington. 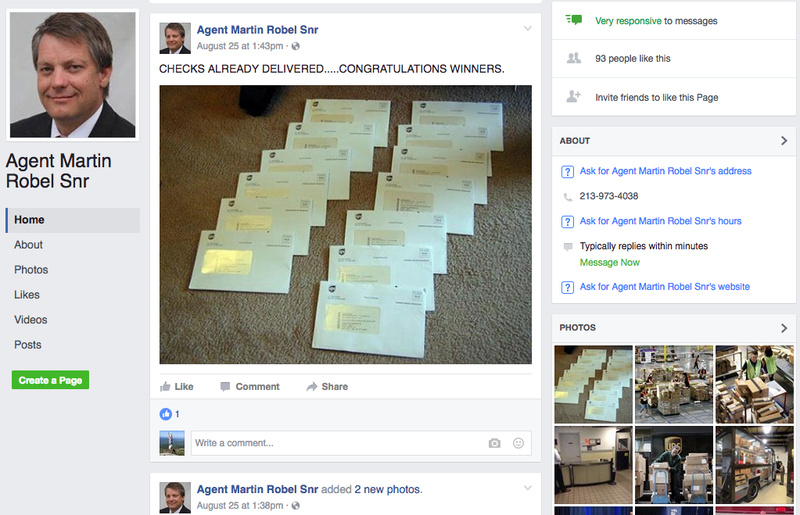 Further down Agent Robel’s Facebook page you’ll see a photo that appears to be a group of 13 envelopes and the accompanying accounement “CHECKS ALREADY DELIVERED……CONGRATULATIONS WINNERS” as if to suggest that Agent Martin Robel is involved in getting money to people who have “won” it. He also lists his phone number as 213-973-4038. 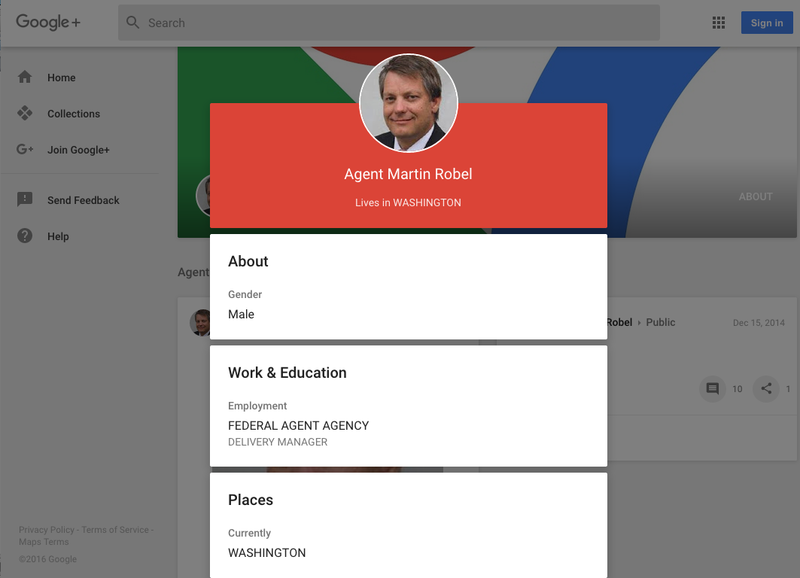 On his About page he also lists his email address as Agentmartinrobel@gmail.com. 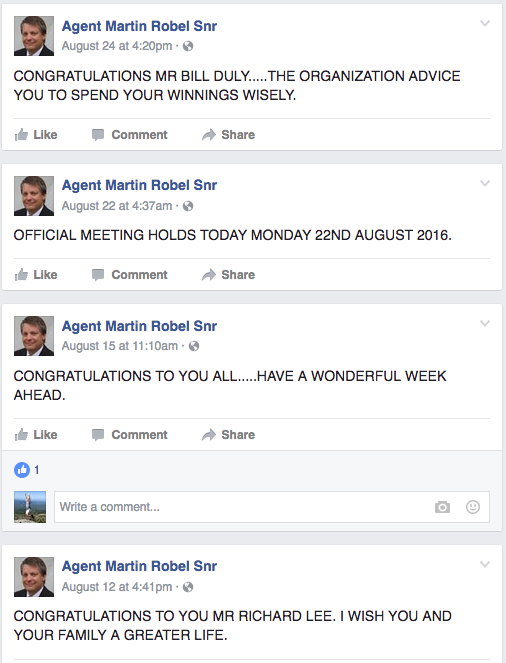 Agent Robel has a few posts and visitors leaving comments. Apparently he likes to write in CAPITAL LETTERS. If you read his few posts from August, 2016 you’ll also see that his English is a bit odd, as if it isn’t his first language. So what’s going on here and why are we certain this is a scam? Let the red flags begin! 1. 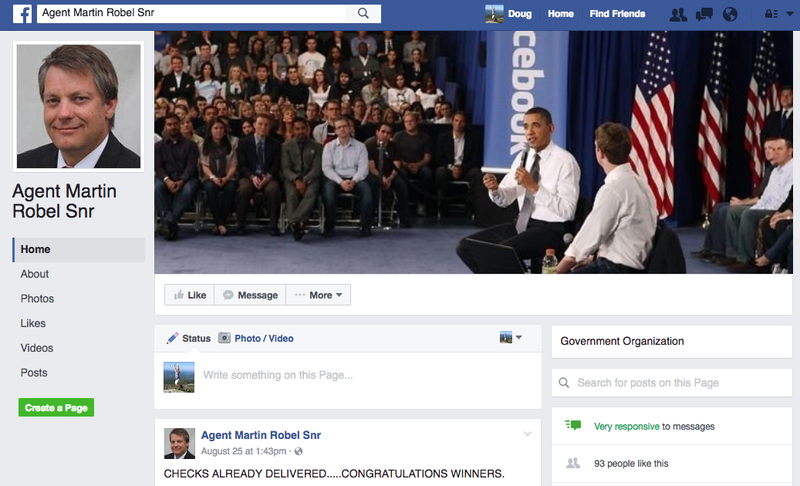 Why would a U.S. government agent post (or be allowed to post) a grant program on Facebook anyway? He looks like a one-man show giving away money to anyone who contacts him. See any formal application procedure? United Nations and Government Money Grants Offer? See any links to U.S. Government web pages? Last time we checked, the U.S. Government had its own website and U.S. Government email addresses ended with dot-gov! Not gmail.com. 2. 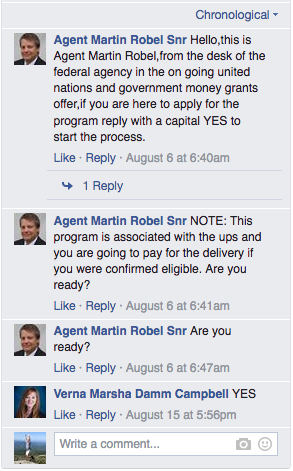 Agent Martin Robel’s English skills suggest that English is not his mother tongue. He uses awkward phrasing and poor word choices in several sentences. We are certain this scammer pretending to be a U.S. Government Agent is not a U.S. citizen and may have set up this scam from outside the U.S.
By the way, don’t be fooled by some of the comments of visitors who are successfully participating in this money give-away. They are likely the scammer himself or a colleague using another Facebook account. For example, read this comment from “Jeff Smith” that was posted on April 5 “Where the meeting is ? I wonder that I am deaf person. Rumour. I will get money’s from you” We know Kindergartners with better English skills. So what’s the scam? Same old fraud with a new face to it… Offer someone free money and all they need to do is to pay the upfront fees. But the money that is offered never arrives once the fees are paid. Or the scammer tricks the recipients into giving up their bank credentials so he can deposit their money but instead the scammer helps himself to the victims money.